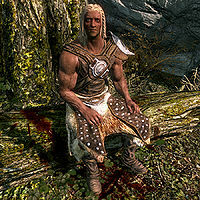 Valdr is a Nord and the leader of a group of bear hunters from Falkreath. 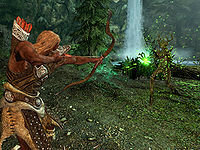 According to concerned Falkreath citizens, people started disappearing in the wilderness not too long ago, including Valdr and his men, who were last seen heading north. During the related quest, you will find out what happened to the bear hunters and put a stop to the disappearances. He wears studded armor and hide boots. He carries a steel sword and a hunting bow with twenty steel arrows. If you are at least level 16 when asking the innkeeper of Dead Man's Drink, Valga Vinicia, for rumors, you may hear about the missing bear hunter, followed by a request: "Folks have gone missing the past few weeks. Word now's that our hunters are gone, too. Say, if you're traveling, could you keep an eye out for them? Valdr and his men. I think they were after bear up north." This will add an objective to your log and a map marker will point you towards Moss Mother Cavern. As you approach the entrance, you will find Valdr sitting on a log, seemingly wounded and talking to himself: "That is a lot of blood. ", "Not sure how much longer I can hold out here." and "I really got myself into it this time." When he sees you, he will call out: "Hello? You! Over here! Please, I need help!" He will also ask: "Please, do you have a potion you can spare? ", and plea: "Please! I'm not sure I'll make it on my own." When you talk to him, he says: "Thank Kynareth for you, stranger. I'd almost given up hope of walking away from here." Two choices are available; both of them will net you the same response, although the second choice will exclude the introduction. Asking him who he is will make him introduce himself: "Name's Valdr. I hunt out of Falkreath." He will then explain: "We tracked a bear to this den. Good coin for those pelts. We had the big sow cornered when they showed up. Three of them, out of nowhere. Spriggans. Niels went down before we even knew to run. Ari died just inside. I never even thought the things were real. I may have lost a drop or two of blood. Truth is, I'm not going anywhere like this. Hurts to breathe." You can then offer him a potion: "I just need a little to get going." You can also offer to heal him with a spell: "Thank you. Please hurry!" Lastly, you can tell him you will be right back: "Please, I need help! I don't want to die on this damned log!" Once you have healed him he will be relieved: "Much better. Thanks, friend. I wouldn't have lasted much longer without that. But now what? I can't just walk away. Not with my friends' bodies in there, being torn apart by those beasts." Two choices will be available. Either you offer to join him in recovering what is left of his hunting comrades, or you ask him to sit tight while you clear Moss Mother Cavern. The latter option will make him say: "You'd really risk your life for a stranger's honor? I don't even know what to say. Thank you, my friend. I'll wait here." He will then remain on his log, until you return. The other option will make him startled: "You'd do that for a stranger? I don't know what to say. Lead on, I suppose." He will then be a temporary follower and will help you fight the spriggans. If you talk to him at this stage, he will whisper: "Step lightly. Who knows if those things can hear us or not." or "Be careful. They're faster than you'd think." Once the cave is clear, he will seek you out and say: "It's done, then. Justice, if you can call it that. Look, I want you to have this. I know it isn't much, but it's important to me. Ari gave me this dagger when we first started hunting together. Always said it brought her luck. You should be the one to carry it now." He will then tell you what happens next: "I'll give them a proper burial, then head back. Come find me if you're ever in Falkreath. You'll always be welcome at my door." He will then stay inside the cave and you will have no other options than to leave. 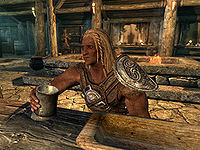 Back in Falkreath, you will find him residing inside local tavern, Dead Man's Drink. He will now have a daily routine, although he stays inside the tavern at all times, either wandering, eating, drinking, or using the alchemy lab in the corner. He was supposed to sleep in one of the beds between 10pm and 8am, but doesn't, due to a bug. Should you talk to him, he will express his gratitude: "Hello again, friend. I'll never forget what you did for me." Also, Valga will start to say: "I heard Valdr made it back safe. Too bad about the others, but at least it's one less thing to worry about." Moss Mother Cavern: Help an injured hunter avenge his fallen companions. He is a member of the bandit archer class, which determines the level of his skills. Because Valdr levels with you, it may be impossible to heal him accordingly on higher levels. This makes the quest impossible to finish. Upon initial contact with Valdr, he will complain about needing a potion, but you may be unable to initiate conversation with him in order to give a potion. Entering Moss Mother Cavern and coming back out again will fix the issue. If you choose to clear the cavern without his assistance, he may be hostile when you exit. To circumvent this bug, exit the cave while sneaking and remain motionless outside. Valdr will approach and trigger the quest-completing dialogue if he does not spot you, even if he is hostile. After completing the quest and receiving the dagger the quest may not update in your journal, causing an arrow to appear above Valdr in the inn but no quest speech option. When you meet him for the first time, you have to start the conversation immediately without treatment. Valdr may become hostile once you heal him. Valdr may attack you on sight later in the game upon entering Falkreath's inn. This page was last modified on 4 April 2019, at 14:44.